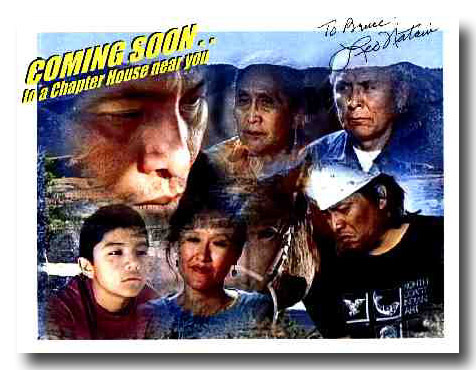 This one-hour movie was shown at local Navajo schools and other public buildings in the Navajo Nation. Leo Natani who plays the grandfather, said his fervent hope is to plant in Navajo youth the seeds to learn their language. "Ninty percent of our kids or even more, don't know their own language. They can't make sense of their traditional values if they don't first know their language." The spoken Dine language brings the audience into the film through the text and emotion. The film is dubbed with English subtitles. During one scene in the film, Jack White, played by actor Curtis Ray Benally, hears his wife recommend the wisdom of medicine men, while the grandfather suggests Protection-Way prayer. In another scene, the grandfather helps the ill father to ingest corn pollen, an integral component of traditional ceremonies. The original flute and guitar music is played by Aaron White, described by one of the co-producers who said it "really helps set the mood and emotions of the scenes." Its been one year since Norman Patrick Browns video, Lii Biyiin, premiered to a special Native American audience at Sundance Film Festival. A video about diabetes prevention is not the usual fare at such a prestigious gathering of film makers, critics, and film lovers. But, Lii Biyiin, or Horse Song, is not the usual film fare, and the fact that the Indian Health Service funded this video is even more remarkable. . . and commendable. Horse Song is about Jack White, a rural, traditional Navajo man, whose puzzling health, both physical and emotional, has been a source of concern and irritation for the entire family. Jack is obstinate in his refusal to go to the Indian hospital where all they ever do is ask you personal questions and stick things in you. But soon Jacks condition worsens. Finding out he has diabetes, Jack begins his difficult journey back to health and harmony, including denial, frustration, learning, acceptance, and Navajo Area IHS Wears New Hat in Video Arena rediscovering the man he used to be and the family he loves. The title, Lii Biyiin, says a lot about Browns lifelong commitment to making films and videos that are purely Navajo. It was shot in Cove, Arizona on the Navajo Reservation, all the actors are Navajo, and it is in the Navajo language with English subtitles. Collaborating with many health professionals at Northern Navajo Medical Center and other diabetes programs serving the Navajo Nation, Brown was able to deliver important information about diabetes while entertaining and evoking the kind of emotions that can lead to healthy lifestyle changes. This 60 minute video was produced by Four Directions Health Communications, which is the media facility at Northern Navajo Medical Center in Shiprock, New Mexico. It is available, along with a group discussion guide, and at no charge, to any group or individual concerned about the health of their community. For more information, call Four Directions at (505) 368-6499. Because it is uniquely Native American, and because it has English subtitles, Four Directions believes all tribes would benefit from the story of Horse Song.